Special guest at Slate & Nature! 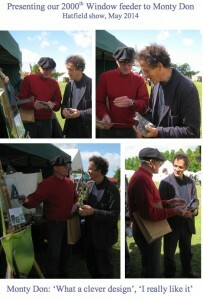 Jeanette & I were very pleased that Monty Don took his time to visit our stand at the 40th Hatfield Craft Fair. We explained him our micro business to enhance the environment by manufacturing special products for in and around the Home/Garden by using reclaimed roofing slate and matching pieces found in Nature. 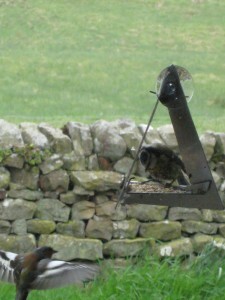 After explaining our very successful and much admired window feeder we handed him number 2000! Sold already internationally around the globe to Slate & Nature enthusiastic ‘bird communicators’ living in Johannesburg (Africa), Brazil, Finland, New Zealand up to California and multiple destinations in the USA. We have now developed the ‘flat-pack’ version in stainless steel, to be launched in the 2nd half of this year (2014) ; watch our dedicated website: www.windowfeeder.co.uk. 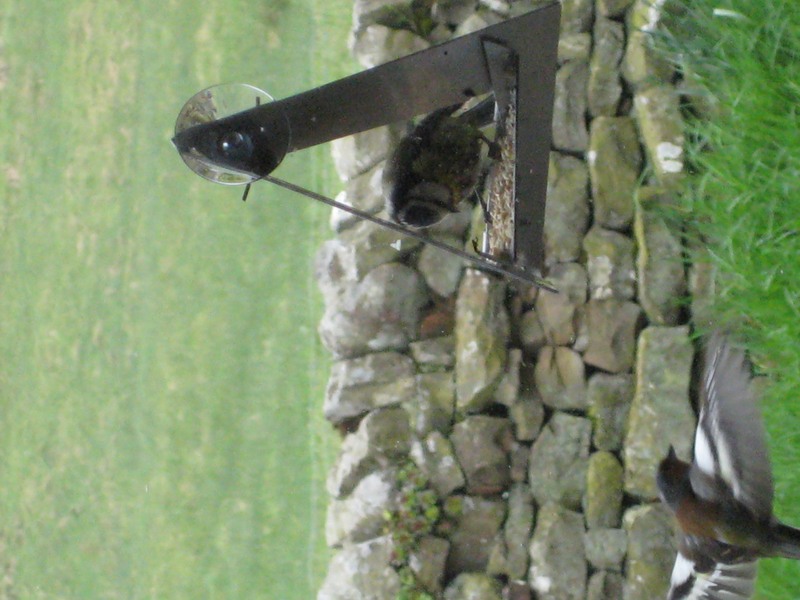 With the exciting prospect of looking at your feathered friends closer than half a meter on your window, this feeder is easy foldable/assembled in a few steps (no tools needed). Started as Nature watching on the 1st floor; it appears you can hang them everywhere! A present for yourself, to make together with your children/partner, or as a ‘companion broker’ for more home bound seniors; All will ‘love to meet the chirp (of a bird)’! It all comes in a flat envelop with a beautiful instruction posted to all addresses in the world. Looking for an unusual birthday present, Christmas gift or just to show your affection to your beloved friend(-s), once ‘pushed’ against your window, also the birds love them, keeping reminding us how nice the world, Nature, is! Slate & Nature; enjoying the environment. This entry was posted in Company News by Jeanette. Bookmark the permalink.